How do you take a written story and transform it into video for others to see? How do you use video clips to promote your writing? 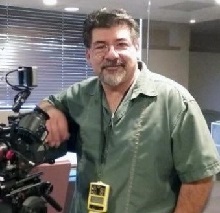 Al Gonzalez will present examples of clips that will enhance your platform. Al Gonzalez is a “get it done” executive producer, director, business coach, and certified mediator with California Lawyers for the Arts. He has been in the film and television business for over 25 years. Al began his career in radio before becoming a film and TV production-special events technical director-announcer. He has taught Radio and TV production for National Broadcasting. Producer’s Boot Camp Workshop is one of his creations. Al trains Independent producers on how to produce low budget film projects. His 400 hours of media experience – corporate, music videos, documentary, independent feature films, and broadcast television productions – have sent him to nine countries and turned him into a popular speaker at schools and business groups. The landscape of YouTube: what it is and where it comes from. What is a channel and how does it relate to Facebook, Pinterest, and other social media platforms? How to customize your presence on YouTube and other should-knows: ideal length, etc. Bring a short original poem to share/copies if you like. A group of like-minded people will help solve writing & publishing problems. Click here to download the suggested organizing form. Lunch included with meeting. Price includes pre- and post-sessions. * Ticket good only for the luncheon immediately following the date on the receipt. The restaurant is located just east of Hazel Ave. at the northeast end of the Nimbus Winery complex along Highway 50. Cattlemens offers CWC a spacious meeting room with free WiFi, quality AV equipment, free off street parking and excellent food. As Sands worked on her memoir, she realized that she was relying on tools she’d honed while working on fiction, and in her talk for the California Writers Club Sacramento, she’ll discuss a few of these, including ideas about plot and structure, POV (yes! even a memoirist must make decisions about point of view), and that essential aspect of any story, imagined or real: Scene. In her talk, Sands will specifically address how to effectively build scenes that are rooted in memory. Whether you’re working on fiction or a memoir, you will learn a lot from this energetic and knowledgeable writer and teacher. Sands Hall’s recent memoir is FLUNK. START. Reclaiming My Decade Lost in Scientology (Counterpoint). 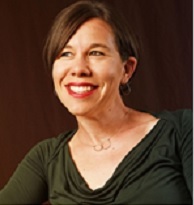 She is also the author of the novel Catching Heaven (Ballantine), a WILLA Award Finalist for Best Contemporary Fiction, and a Random House Reader’s Circle selection; and of a book of essays and writing ex­ercises, Tools of the Writers Craft. Her short fiction has appeared in such journals as Iowa Review, Green Mountains Review, and New England Review. 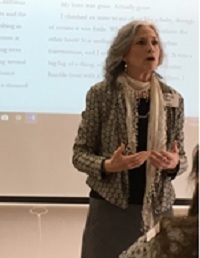 She teaches for the Iowa Summer Writing Festival and for the Community of Writers at Squaw Valley, and is an associate teaching professor at Franklin & Marshall College in Lancaster, Pennsyl­vania. Sands is also a theater artist: actor, director, and playwright—her play Fair Use explores the controversy surrounding Wallace Stegner’s use of the journals and letters of 19th century writer and illustrator Mary Hallock Foote in creating his Pulitzer Prize-winning novel, Angle of Repose. Also a singer/songwriter, Sands’s CD is called Rustler’s Moon. She lives in Nevada City, California. Audiobooks are hot – but they can be costly to produce. Find out what you need to know to make good decisions about audio and how to leverage an audiobook – or your voice in general – to get your name out there and more books sold. Whether you read aloud at cafes, Open Mic, or in the car, you’ll benefit from this information. Becky will provide insights that will inspire you and help you see new ways to get your writing out there. Key considerations in audiobook decision-making and other ways to use your voice. When the audio investment is worth it and when is it not. Tips on how to make the audiobook investment pay off once you’ve made it. 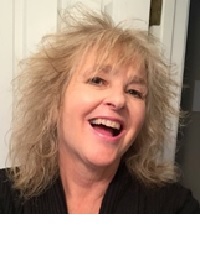 Becky Parker Geist is an audiobook narrator and producer with 37+ years of experience, and the founder and owner of Pro Audio Voices. She fell in love with narrating audiobooks in 1981, when she began narrating for Library of Congress. 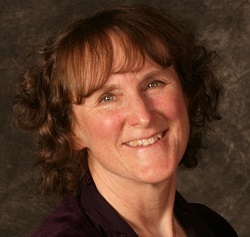 As a voiceover and theatre professional and using the name Becky Parker for all her performance work, she brings her theatre skills – acting, directing, producing, and marketing – to bear in all her voiceover and production work. Becky has narrated well over 100 titles to date. Becky serves as President of BAIPA (Bay Area Independent Publishers Association) and is a member of IBPA (Independent Book Publishers Assn). She has been quoted in publishing articles and is considered ahead of the trend in audio books. Other organizations to which she belongs include: Audio Publishers Association, Society of Children’s Book Writers and Illustrators, Theatre Bay Area, and Business Network International. Becky’s independently published book, Audiobook Toolkit for Authors: Your Comprehensive Guide to Recording Your Own Audiobook, can be found at authortoolkits.com. She is also the author of two additional non-fiction titles and two children’s books. There are many different types of editing (proofreading, line editing, spell checking, grammar checking, copyediting, etc.) but this talk will focus on the big picture aspect: developmental editing. Editor and writer Wendy Tokunaga will give you practical tips on how to analyze your own writing and identify issues you can fix to make your novel, memoir or shorter work shine. Determine if there is enough dramatic conflict in your scenes. Read like a writer to improve your own writing. Why hybrid publishing has been called “the best of both worlds” and what about it makes it appealing to authors and self-publishers alike. Hybrid industry standards and why its reputation hinges on vetting and quality. The challenges facing hybrid publishing and authors who choose this model. What writers and authors need to know about this publishing space and the business model. Where hybrid publishing might be heading from here. The hybrid publishing model occupies space that’s neither traditional publishing nor self-publishing. So what is it exactly? And why is it the fastest-growing publishing business model? Find out how this middle ground of publishing is opening up more and interesting business opportunities for authors and publishers of all stripes.